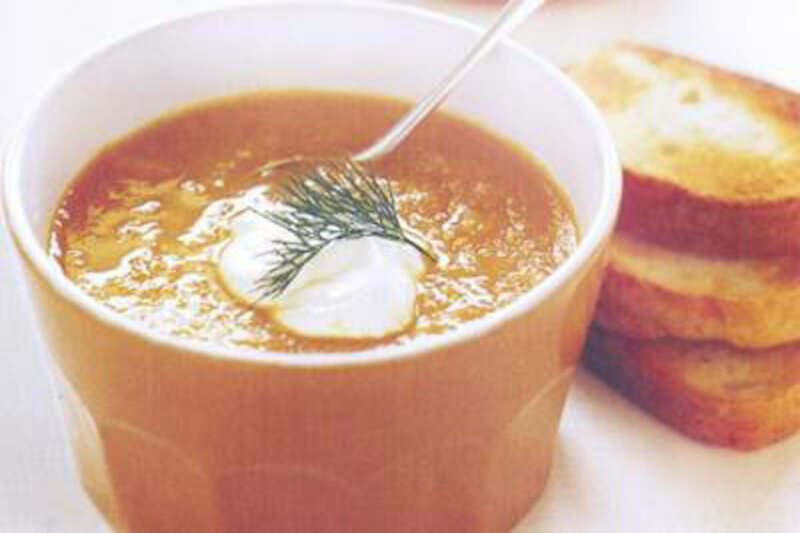 This quick and healthy carrot soup is a great way to bring an abandoned bag of carrots to use. If you like some heat, use a hot curry powder in this recipe or just season with paprika. It’s quite appropriate for simple lunch recipes that you can enjoy with toasted bread. RecipeSavants.com This quick and healthy carrot soup is a great way to bring an abandoned bag of carrots to use. If you like some heat, use a hot curry powder in this recipe or just season with paprika. It’s quite appropriate for simple lunch recipes that you can enjoy with toasted bread. Smart Recipes, American Recipes, Vegetables Recipes, Recipes Vegetables American Carrot Soup PT45M Serves 4 Ingredients: 1 Tablespoon Olive Oil 1 Leek 6 Carrots 4 Pieces Ginger 2 Cups Salt-Reduced Vegetable Stock 1 Dollop Light Sour Cream 1 Tablespoon Fresh Dill 0 A Few Bread Toasts In a large pan, heat oil over medium heat and cook carrots, leek and ginger for about eight minutes, stirring occasionally. Add stock and 2 cups of water and bring to a boil. Reduce heat to medium-low and simmer, covered for about 20 minutes. Remove from heat and keep aside to cool slightly. In a blender, add soup in batches and pulse until smooth. Return soup to pan over medium-high heat and cook for about two to three minutes or until heated completely. Season with salt and pepper and remove from heat. Serve hot with the topping of sour cream and dill alongside toasted bread.